Recently a friend has lent me a much better bike for going about on, so I dont have to use as much fuel, and can stay in one spot for a few days if I like. Of course this means my electricity runs out after a few days, especially if using the computer a lot. 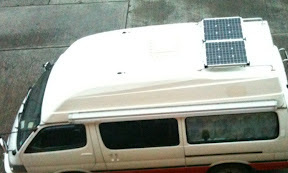 So, the solution, 80 watts mounted on the roof with stainless pipe fittings and aircraft fasteners. This is actually a portable panel, so it can be removed and folds in half, has latches and a carrying handle. Its permanently mounted now though. I’ll post more pics showing how I have it hinged at the front, and wing nuts release it at the back – it can be angled up to 45 deg to capture more sunlight when I’m parked up for a few days. I’ve also installed a very good needle gauge type volt meter so I can always see the house battery condition. So now – just to get the cable connected. A local motorhome guy will be fitting my kayak roof bars soon, and he’ll put the cable through the roof and seal it when we are installing the brackets.